We do this move every week in class! Is it like yoga? Will I break a sweat? Will it make me thin? Will it fix my back? Will it be able to make me touch my toes? Will it give me a bottom like Pippa Middleton? What if I don’t like it? What if I fart? What’s with all those machines? Will I need a pedicure? What shall I wear? Why bother? Pilates. Popular with dancers, pregnant ladies and physiotherapists. But for some, a complete step into the unknown. Many women arrive at a class with trepidation, fearful of beautiful people with long bendy legs. Fewer men arrive, motivated by pain or their physiotherapist or wife telling them to try it! In the early part of the 20th Century, with a little help from his wife Clara, Hr. 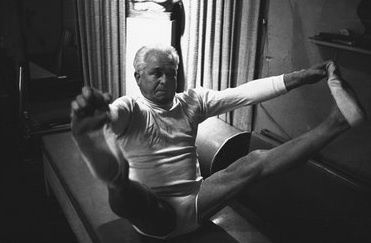 Joseph Pilates (he was German) developed the physical exercise system we now know as Pilates. Originally called ‘Contrology’, controlling the body through the mind, it became popularly known as the Pilates method. Our Joe had been brought up a bit of a hippy. His mum was a naturopath, so a bit ‘alternative’ and his dad was an award winning gymnast. A sickly child – Joe suffered from asthma, rickets and rheumatic fever – he devoted his life to studying ways to get back to health. He lived in an era of ‘medical gymnastics’, or exercise as medicine. He studied gymnasts, yoga, Qigong and became a gymnast, diver and body builder. All big influences on his exercise system. On moving to the UK in 1912 he became a professional boxer and taught self-defense for Scotland Yard. As a german, the onset of WW1 led to his confinement in an internment camp. He used the time to learn and train his fellow inmates and to develop his system, apparently using the bed springs to create his own equipment. After the war he worked in New York with dancers (including the notable Laban) and developed his system into the exercises we know today. Fundamentally, Joseph Pilates believed the key hindrances to health were modern lifestyle, poor breathing technique and bad posture! And perhaps it’s these parallels with our lives today which have made it so popular. Pilates is a system of exercises designed to lengthen and strengthen muscles. It’s focus is on the spine and the core muscles which support it. It is resistance training using either body weight alone in mat work classes, or small equipment like balls. As well as using your muscles, you’ll be stretching and moving around a bit and breathing deeply – so it can also be pretty relaxing. Pilates can also be practised on various larger pieces of equipment like the Reformer (a system of pulleys and springs). How is my class feeling today – do they want progression or do they need to chill out? Have I got my participants’ joints and spines moving so they’ll feel better when they leave? Have I worked my class all over – abdominals, backs, bottoms, shoulders, pelvic floor? Has my class REALLY understood the concept of core abdominals, pelvic floor and shoulder stability today? Has my class tried something new today? Has my class really connected today in some way – through laughter, focus, or a furrowed, concentrated brow? Have my participants stretched their bodies today – do they feel a little more supple? Are my participants walking out with better posture than when they arrived? There’s nothing snooty about Pilates but it does take time to practise and understand the key concepts, so it’s not the sort of class you can dip in and out of. Of course, the best way of finding out what all the fuss is about is to try it for yourself. Go on, we won’t bite! To my class participants past and present, I’d love to hear your comments on what Pilates is all about. abdominals, breathing, core, exercise, flexibility, Joseph Pilates, mobility, pilates, spine, stretching. Bookmark. I get the “what is Pilates” question a lot … and spend a lot of time explaining that yes, it is different than yoga, yes, it’s a whole lot more than stretching, yes, it’s harder than it looks, and yes, it’s DEFINITELY worth working into your weekly routine! Hey Sarah. I always get asked, is it like yoga? It is so hard to sum up though. And I often feel newcomers are put off/feel intimidated.